What’s so special about the Endura-Form panel? The Endura-Form panel is an injection moulded plastic resin panel with one side textured and grooved and the other side socketed. The sockets are designed to interlock (male/female) with other identical panels. This allows you to create super-strong panel units or they can be offset for bigger panel units. Panels can be put together easily with or without bolts and assembled or disassembled with a minimum of fuss. The panels are designed to allow pipes, cables, wires and rods to be installed in either direction. They can be made from 100% recycled or virgin material and are 100% recyclable. Endura-Form panels are tough, super-strong and easy to handle. Individual panels measure 32″ x 48″ x 2″ (two interlocked panels make one unit 4″ high). They weigh 32 lbs per panel. Panels can be cut or machined with standard tools. They have been tested to withstand up to 803 psi. 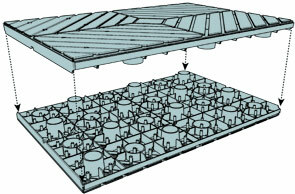 The above illustrations show how two identical Endura-Form panels interlock to form a simple unit. Endura-Form panels are made to allow running heating pipes and wires to provide an easy way to install radiant heat indoors or out. 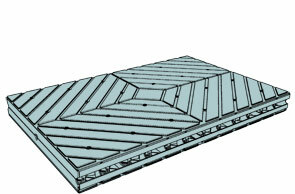 The above drawings show the options for combining panels to make discreet or interlocking panel installations.